Bingo, Alex. Right to the point. And you got some great assistance from Judge Smails and One-Putt. It's all about the freaking media. Unless you're a hardened golf fan and enjoy following the LPGA, chances are you may have heard nothing or very little about anyone except Annika. Paula is a doll and can win; Lorena is sweet yet intense; Juli is personable and intelligent and still beats the kids; Se Ri and Karrie provided us with two of the most dramatic moments in golf this year and yet, unless you watch The Golf Channel religiously, it is unlikely you would have more than a passing mention of their accomplishments. In contrast who would not believe that if Michelle Wie had made the cut in a men's event, the Network Evening News would have carried it as the lead story. Katie Couric would have been slobbering. And therein lies the problem for the LPGA. How does this marvelous group of female golfers get the attention off of a teenager who has yet to win a tournament (save for a USGA Publinx) and onto those ladies who are accomplished, athletic and attractive? The major golf publications don't even give proper recognition to the women. Within the past couple of days an www.SI.com writer listed the best tournaments of 2006. The U.S. Open and the British Open were 1 & 2. Number 3 was the Kraft-Nabisco. This is so far off base that it is not even credible. A strong case can be made for the Kraft-Nabisco, the LPGA Championship and the U.S. Women's Open being the top three of the year. 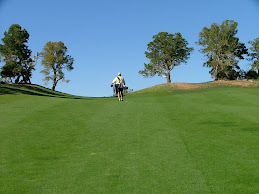 But, if you think that will happen in a major golf magazine, come see me and I'll get you on to Pebble Beach for free. The LPGA needs to figure it out and here's a little help with step one. Let the bloggers provide some assistance. There's thousands who would be extremely cooperative in the venture to show off the LPGA. The LPGA must begin to realize who really loves them.